Andrea Agnelli was left fuming after his side were dumped out of the Champions League by a late Real Madrid penalty. Referee Michael Oliver pictured during tonight's match. 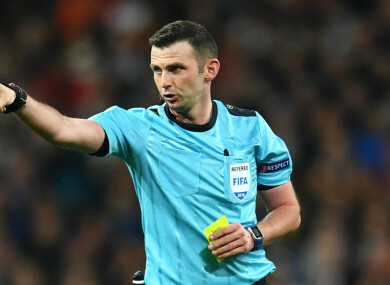 JUVENTUS PRESIDENT ANDREA Agnelli accused referee Michael Oliver of being in “total chaos” and hinted at a conspiracy against Italian clubs after a controversial penalty call saw the Serie A leaders knocked out of the Champions League by holders Real Madrid. With extra time looming after Juve dramatically hauled themselves level on aggregate following a 3-0 first-leg loss in Turin last week, Oliver pointed to the spot in stoppage time when Mehdi Benatia challenged Lucas Vazquez. Replays appeared to show Benatia touched the ball with a leg stretched around Vazquez, but the defender had also placed his hands on the back of the substitute as the Madrid man was poised to finish. After Oliver awarded the spot-kick, Juve captain Gianluigi Buffon furiously confronted the English official and was consequently sent off, with Cristiano Ronaldo smashing the penalty past replacement Wojciech Szczesny to settle a dramatic tie. Juve felt Juan Cuadrado should have been given a penalty during the clash in Italy and Agnelli did not hold back in his criticism of Oliver after the return meeting at the Santiago Bernabeu, suggesting the English official was biased and calling for video technology in Europe’s elite competition. He told Mediaset Premium: “I see a series of countries that implemented VAR and I saw incidents that went against Italian clubs recently, such as the foul on Cuadrado, AC Milan at Arsenal and Juve tonight, proving we absolutely need VAR in the Champions League. “This isn’t about one or two points, but rather going forward in a massive tournament that brings so much money and prestige. We can’t allow these incidents to occur. “For some reason, the vanity of the refereeing designator is trying to scientifically prove he is unbiased and keeps assigning referees who are against Italian clubs. “Players make mistakes, so do referees, but this official completely lost control of the situation. A referee in Madrid for the quarter-final must have seen the first leg, realise the [Paulo] Dybala red card was excessive and understand the various situations. “The referee tonight was in total chaos. It’s a pity, the performance of the boys remains, we confirmed – as PSG did last season and Roma last night – you can come back from 3-0 down to turn things around. Incidents happen, the referee didn’t understand the moment at all. Email “Juventus president calls for VAR after accusing referees of bias against Italian clubs”. Feedback on “Juventus president calls for VAR after accusing referees of bias against Italian clubs”.